Shaw Law Firm focuses its representation on individuals and families who have been Injured. We represent clients involved in Automobile accidents, Tractor-Trailer accidents, Motorcycle accidents, Hit and Run accidents, Drivers with no insurance accidents, Pedestrian and Bicycle accidents. We also handle claims associated with Dog Bites/Attacks, Injuries on the Job, Workers’ Compensation, Medical Malpractice, Nursing Home Abuse, Prescription Errors and all Injuries involving Children. 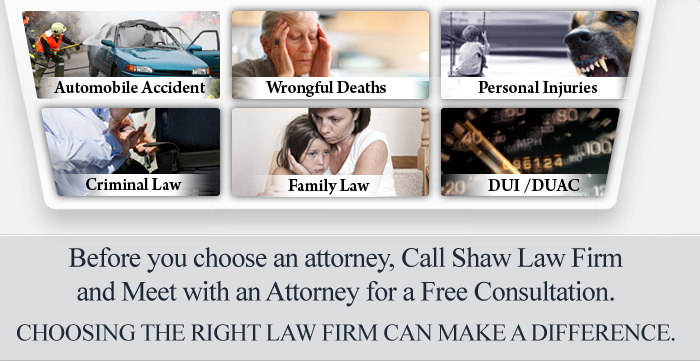 Shaw Law Firm is also dedicated to representing families and individuals going through difficult situations. Divorces and persons accused of Crimes, including alcohol and drug related charges, are the focus. THANK YOU FOR VISITING SHAW LAW FIRM. 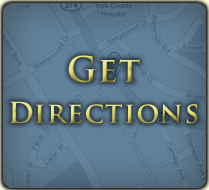 There are many ways to contact us and schedule an immediate appointment. You can call us directly or use the several forms in this site. You are the most important part of our practice. You, Your Family, Your Livelihood and Your Needs. Our Goal is to attain the Best Possible Outcome for you and your family. Hiring a Lawyer may be one of the most important decisions you will ever make. Be particular about the Law Firm you choose to represent you and pursue your matter. Before you hire anyone, you should take time to get to know the law firm and what the firm can do for you. At Shaw Law Firm, We enter into each case Together with our clients recognizing mutual Respect. We work hard to fight for our client’s rights and are committed to zealously representing our clients to meet their Individual Needs. We will sit down together and review a strategy that works best for your individual matter. Our office is conveniently located at 1169 Ebenezer Road in Rock Hill between Winthrop University and Piedmont Medical Center.